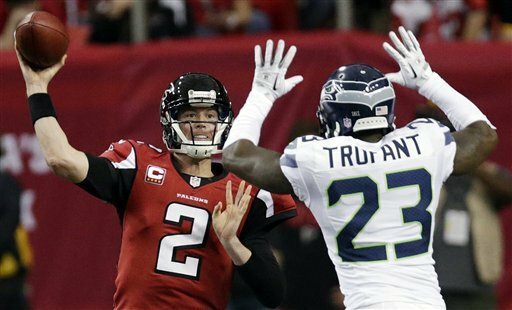 The Atlanta Falcons nearly pulled one of the great chokes of all-time Sunday vs the Seahawks, but in the end, their two Matt’s – Ryan and Bryant, bailed them out with a 30-28 win. The Seahawks scored three times in the fourth quarter to comeback from a 27-7 deficit to take a 28-27 lead with :31 seconds left. Ryan took over, hitting two passes to get Bryant in position to kick a 49-yard field goal with 8 seconds left. Russell Wilson’s Hail Mary pass at the buzzer was picked off in the end zone by Julio Jones. Wilson nearly pulled off a miracle comeback for the Hawks, throwing for two touchdowns and running for another. He ended the day with 385 yards passing and did all he could to lead the Seahawks back.